Let us look at "迁" more closely. It consists of "千" and a (walking), We have learnt "千" and know that its original meaning is "moving". Since "千" is eventually used to mean "Thousand" only, Chinese ancestors added to "千" to create another character "迁" to mean the same - "Move". 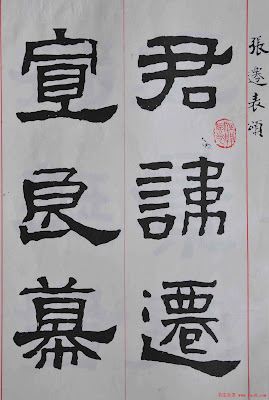 As "迁" contains the meaning of "moving to a new place for changes", it can have meaning of "Change" as well. Oracle Script of "遷" is missing here. The reason I think is because "千" was used during that period. As "千" is eventually only used to mean "Thousand", Chinese ancestors needed to create a new character to mean "Move". Bronze Script consists of （Many hands packed up bags ）and (邑，which we will learn later, means Foreign Land). So means "packed up and move away to a foreign land". While Seal Script removed and added (walking), it also added (population) to bottom of to get . So means "people packed up and moved". When it came to Clerical Script , its part has been changed to ,with part been simplified to . It became very similar to what our traditional Chinese character is - 遷. As a conclusion, 迁 | 遷 means "Move", it can mean "Change" as well. In certain idioms, 迁 | 遷 contains the full meaning of "packed up and move away to a foreign land" or "people packed up and moved". Note that "千" and " 迁 | 遷" has the same pronunciation. Next lesson we will continue to "Ten Thousand", get ready!